SharePoint 2013 Visio Services provides a great solution for viewing the actual Visio file directly within a SharePoint web page, however you need to be logged into your corporate web to do this. So, how can you view Visio files in a web page if you cannot use Visio Services? 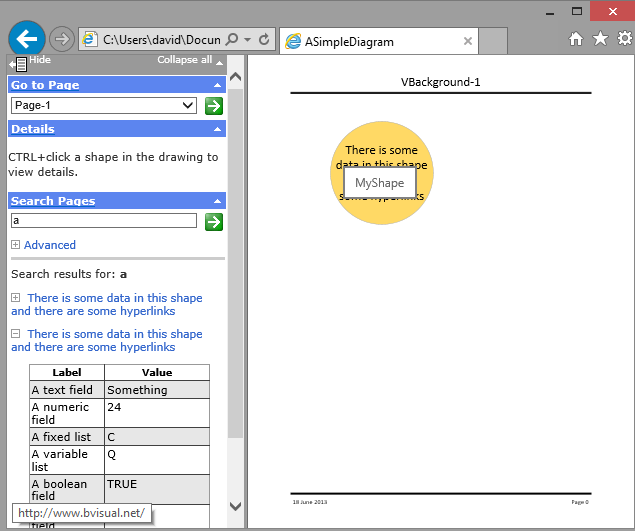 You could build a web page with the Visio Viewer control, but that is ActiveX and will only work in certain controlled conditions. The benchmark has to be allowing the Visio file to be viewed on an iPad, or an Android tablet, or Surface RT. Visio Services in SharePoint 2013 will enable this, and will allow for the Visio document to be zoomed, panned, and the Shape Data and hyperlinks to be viewed and used, but, again, this is not always available. Firstly, I am making an assumption that providing access to the original Visio file directly is not always desirable, so providing a controlled export to a suitable file format is acceptable, provided that certain features are available. 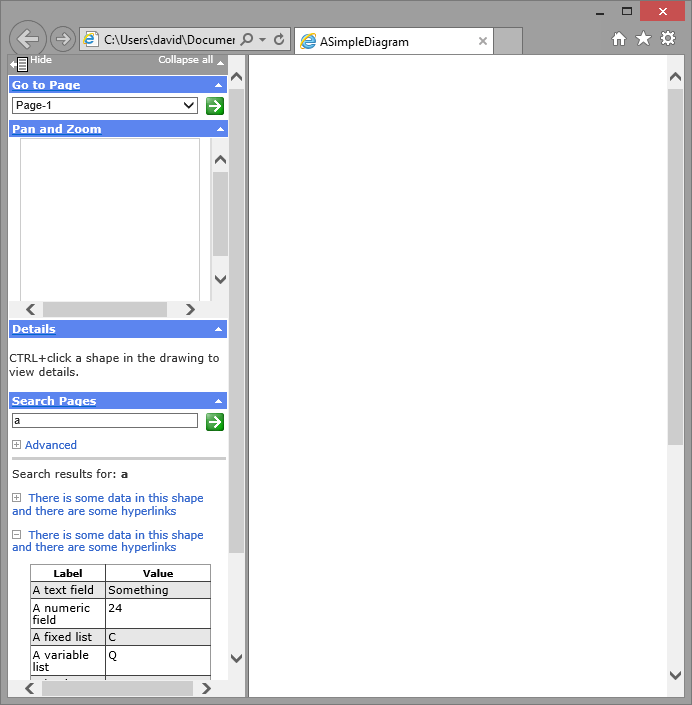 I invariably work with shapes that contain data and hyperlinks, and thus I need the end user to be able to click on a shape to view the data, or to provide access to the hyperlinks. I also need the graphics to be pan and zoomable, and it would be useful if the end user could search the data to identify the shapes they want to see. So, what are the options? 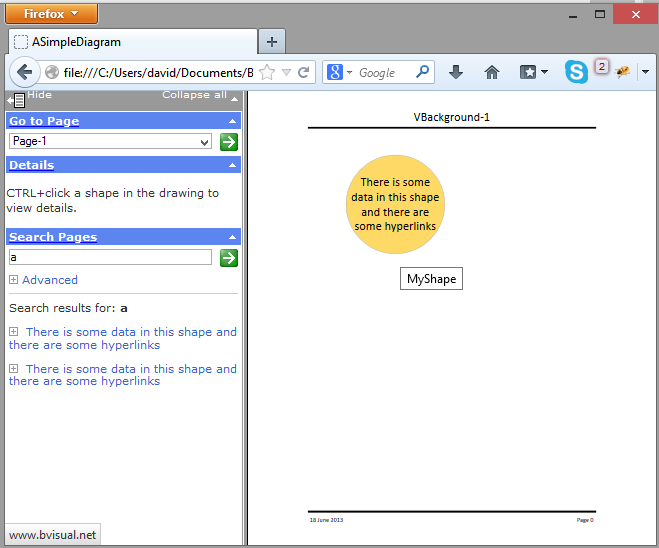 In this article, I compare the output from Visio as web pages in VML, SVG and XAML when viewed in MS IE 10.0.9200, Google Chrome 27.0, Mozilla Firefox 21.0 and Apple Safari 5.1.7. 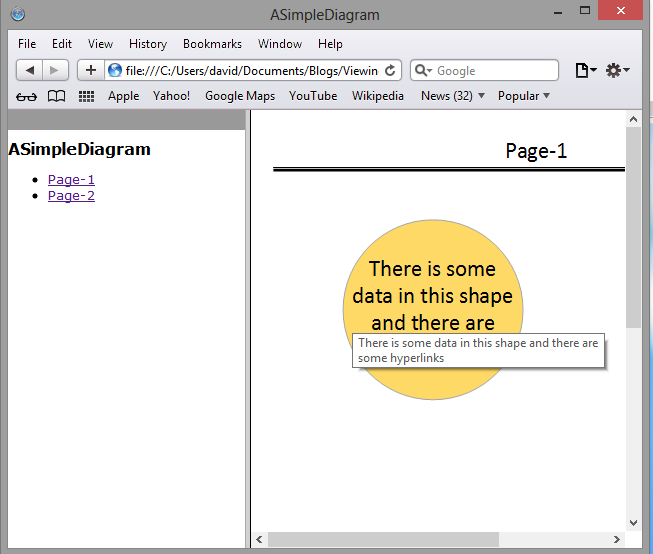 I created a two page Visio 2013 document (well, three actually because they both had the same background page), and I put a single shape on each page with the same eight Shape Data rows (one for each data type), and with three hyperlinks on. I am including some notes on the output to PDF and Xps because I recommend them being available as a download link, if you want your web users to have a printable copy, because printing directly from a browser is less than optimal! 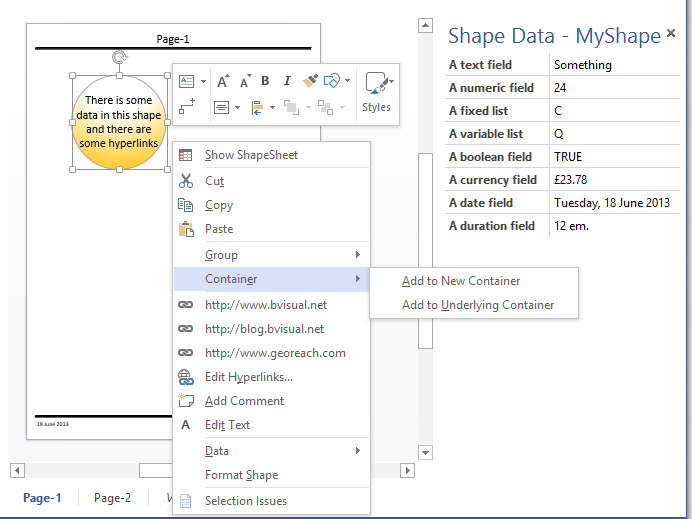 Visio has an option to export or save as a pdf file. 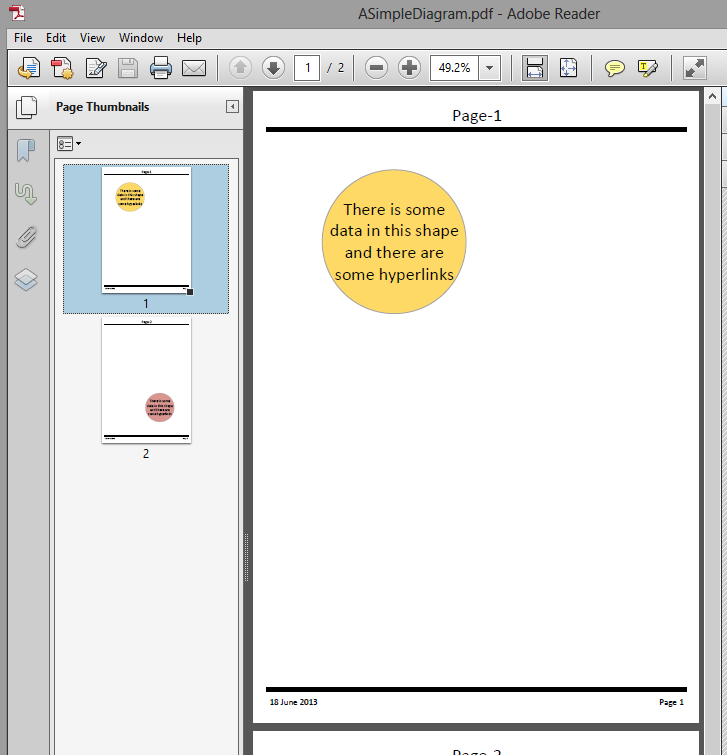 This is done using the OpenPDF format, and it created thumbnails and bookmarks for each of the two foreground pages. 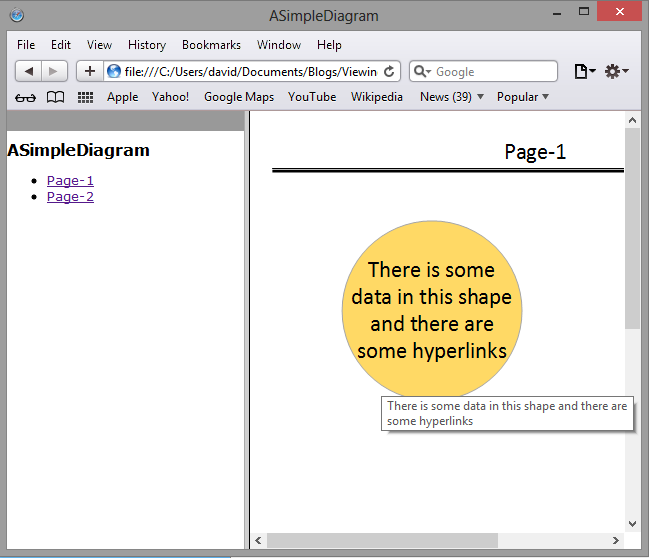 The first hyperlink is available to follow on the shape. However, the Adobe Acrobat version does not have bookmarks or hyperlinks … disappointing, but it maybe that Adobe has not caught up with Visio 2013 format yet. 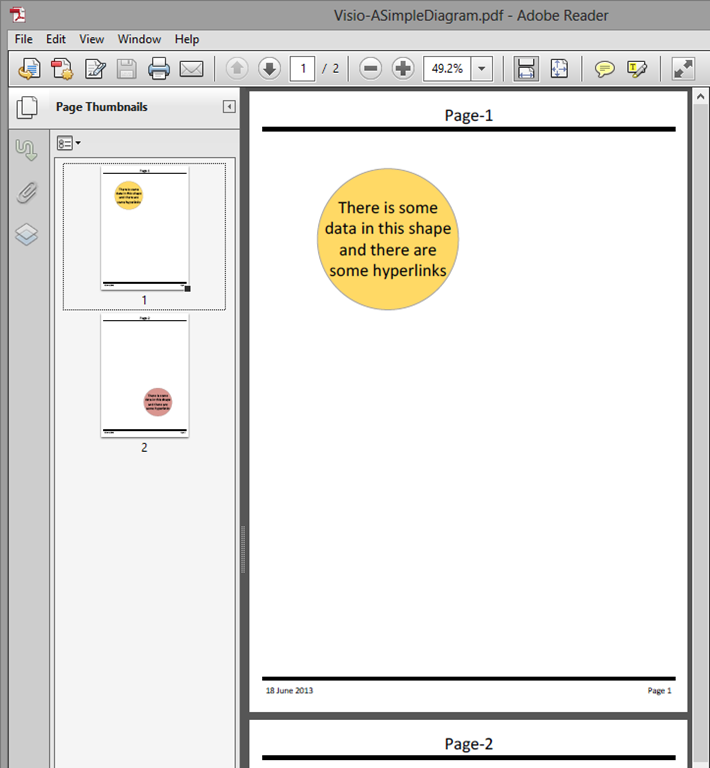 It is a shame that layers, Shape Data and multiple hyperlinks are not available in either PDF. Visio also has the ability to export to XPS quite faithfully with regards to the graphics, but it is a shame that it also does not export the layers, Shape Data, or allow access to multiple hyperlinks per shape. MS IE 10 … oh dear! Then everything magically appears again! The VML web pages in MS IE do provide the best experience with pan and zoom, search, Shape Data and multiple hyperlinks … but maybe that is because Microsoft wanted it to be the best option. Unfortunately VML is not supported in anything but MS IE, so the graphics are rendered in the fall-back raster format, which was PNG in my case. However note that Firefox displays the widgets, and displays search results, but does not point to the shape like the MS IE display does. All of the browsers render the page name correctly. 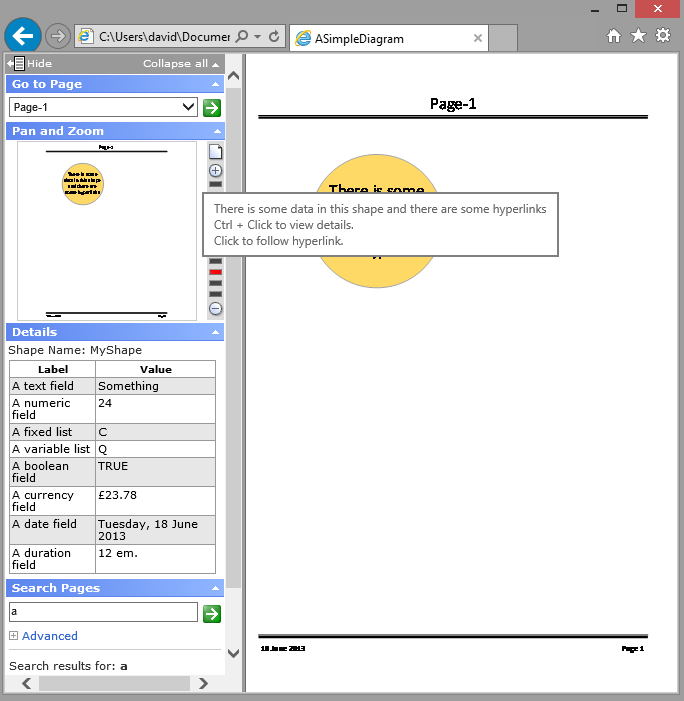 The SVG format almost works in MS IE, however, there is no pan and zoom window or multiple hyperlinks support, and the click to display Shape Data does not work, although the data is shown if the search result node is expanded. The Firefox display is close to the MS IE, except that the search result nodes are not expandable. 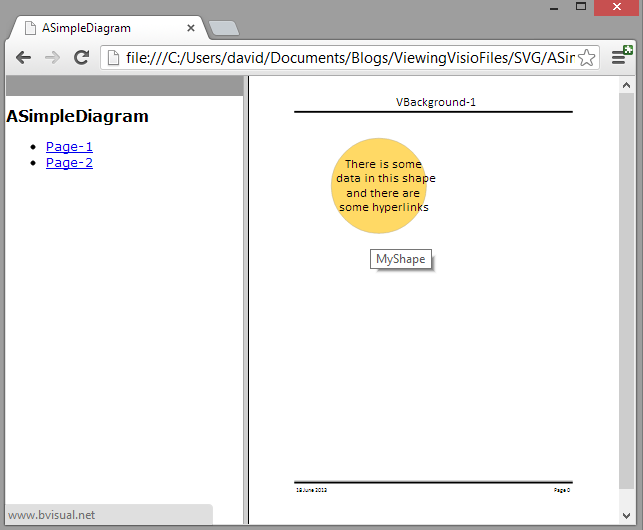 Chrome displays the SVG graphics, but does not show the widgets for page navigation, search or properties. Safari is the worst because the SVG is not rendered at all, only the fall-back png. All of the browsers render the page name incorrectly. The XAML display n MS IE is almost as good as the VML, except that it does not display the multiple hyperlinks on each shape. Again, Firefox is almost as good as MS IE, but the result nodes are not expandable, and the Shape Data display does not work on click. Chrome and Safari are as bad as each other, with both of them falling back to the png display. The browsers that do render the XAML fail to render page name correctly. What is clear is that Visio renders its web export best in MS IE, followed closely by Firefox, then Chrome, and finally Safari. However, the experience in the non-Microsoft browsers is disappointing, but the fault is not those browsers, but out-of-the-box files generated by Visio. This doesn’t recognise Chrome at all (some specifics for Firefox for example). Showing its age. It also appears to run foul of some security restrictions in that the browser has to read a file data.xml in the same directory. Chrome (and indeed other browsers) require various hacks to do this. For example you need to run chrome with flag –allow-file-access-from-files and possibly even the flag –disable-web-security – this doesn’t exactly raise confidence!! 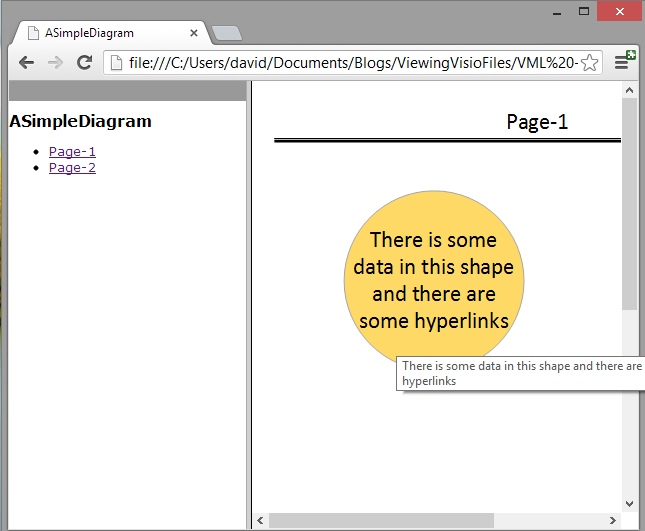 Another comment on the XAML vs VML formats – they handle multiple URL links differently. in VML, if you have multiple links, then when you click on a shape you are prompted with a (dynamic) menu prompting you to be specific. In XAML this does not happen (certainly in IE10 and IIRC in IE9 as well) – you just get the “default” URL (which is the first one). I have previously reported this to Microsoft … I hope they have paid attention too! 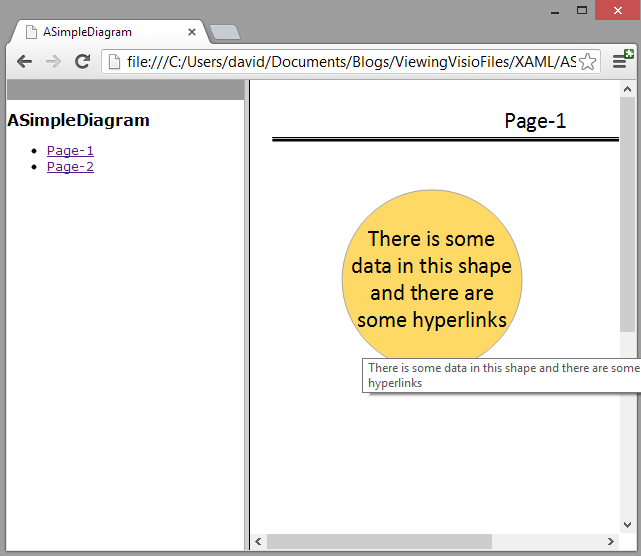 For some reason I am unable to see multiple links in either VML or XAML.. It seems pretty straightforward from everything I’ve seen online, but I can’t make it work.. Is there anything I’m missing? It is now straightforward if you are using the Visio Web Access control in a SharePoint web page … not straightforward in SaveAsWeb. 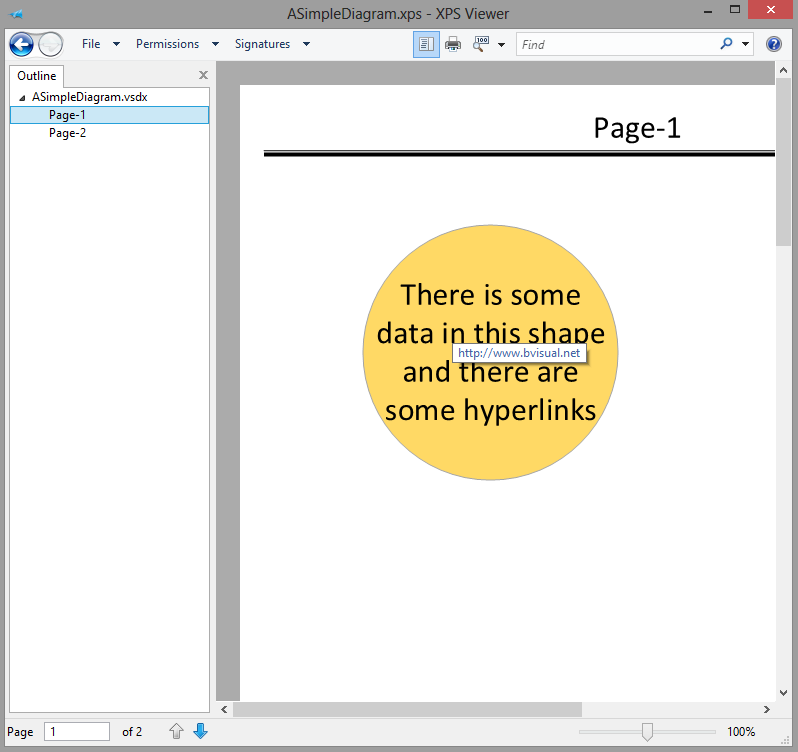 The Microsoft Visio Viewer control gives you access to multiple hyperlinks. I create Visio 2010 process models (Product development process) and publish it to webside (Client Intranet). The client company uses IE10 an everything is represented well (graphic, links and the table representing the shapes datasets in the left area. 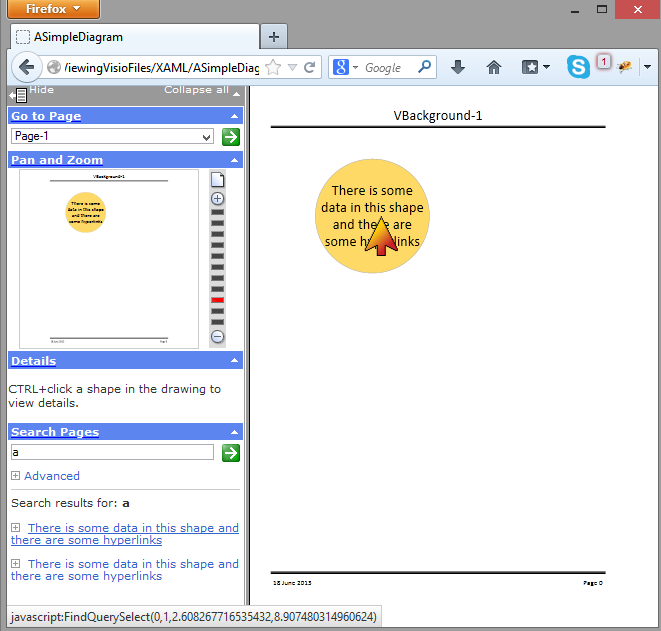 At my personal computer I’m using firefox and I cannot find a solution to get the representation of the shape data. could you give me a instruction to solve the Problem ? Visio 2013 has now been patched to provide the Pan & Zoom; Details and Search panels on the left side in IE11, if you output as XAML format. I am currently trying to get my Hyper-V with Visio 2010 on it working so that I can test that. I’ve come to a problem when saving my Visio Document as a Webpage. My boss requested a .html document with hyperlinks and some stuff, but he doesn’t want to use Silverlight. So I’ve just figured to go with VML as output, but here is the thing: Once I save it as web page, my hyperlinks seem to migrate from the shape itself to the borders of the same. How does this come? Do you maybe got some hints what I could’ve done wrong or what has gone wrong? As additional information, I’m using Visio 2010 and IE9. If he doesn’t want Silverlight, he probably wants it to be viewed in multiple browser types. VML is only supported by pre-IE 11. I need to update this article to test latest SP to Visio 2010, and Visio 2013. 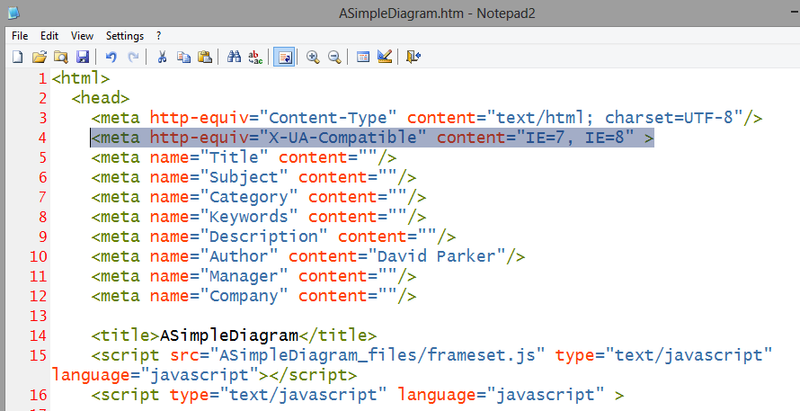 I am using VML web export in IE11 just fine. I only had to edit the zoom.htm file to handle the pan&zoom drag box correctly. 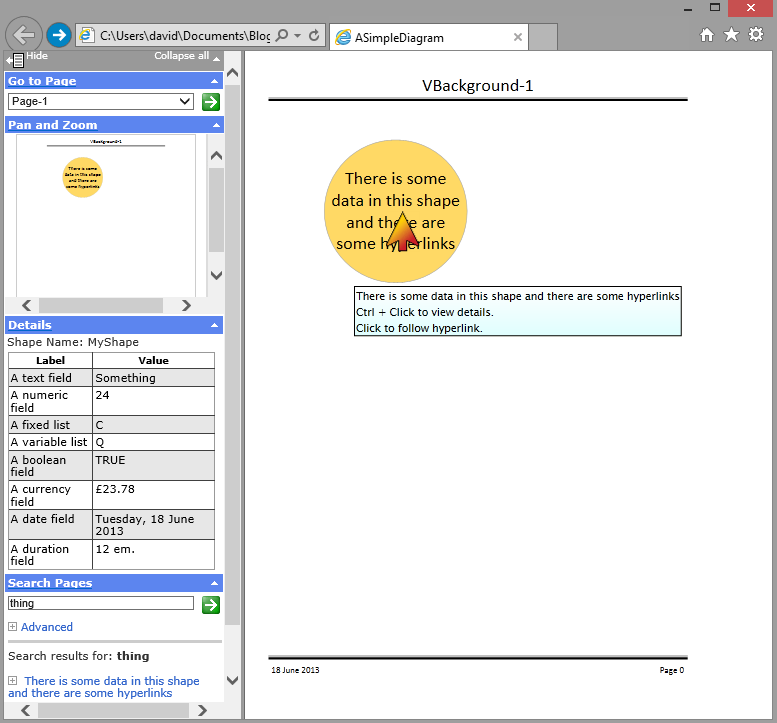 Using Visio 2010 and Visio 2013, IE8 and IE11. @Sean C: I’ve mailed you my solution. 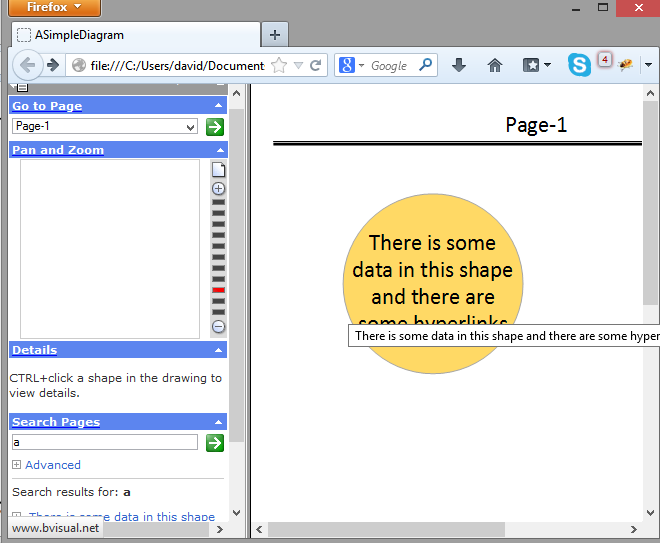 I export to multiple output formats, such as VML, XAML, SVG and PDF, to serve different browsers. Users can switch format from a modified widgets toolbar. Therefore, I made the zoom.htm file to auto-detect the format plus browser and handle it correctly, using the necessary fixes. I guess it is a bit much to publish the solution to this blog as a comment, and I should clean it before sharing on a website. If you do blog your solution, then please send a link in here too? Thank you for this article ……… it’s helped me !! 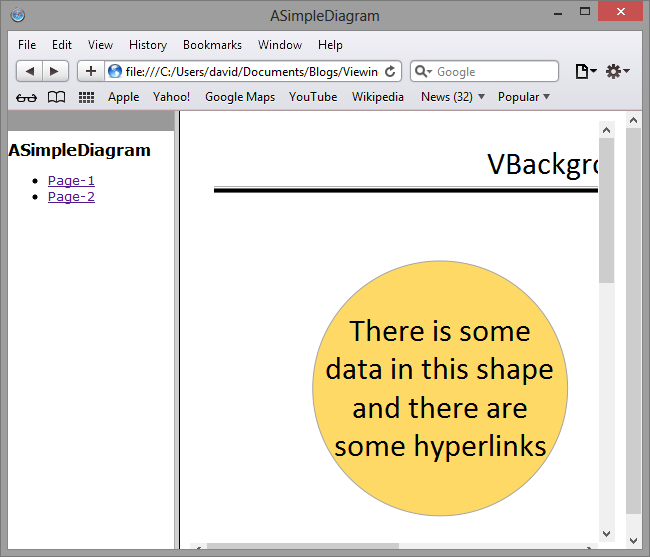 I am wondering if you could give me a hint why I do not have active hyperlinks in my Visio drawing which I export to HTML. I use VML Output format and it creates all the HTML files but when I move over the boxes in the drawing there is no hover effect nor a active hyperlink. I am working with MS IE 9. Do you hava an idea?